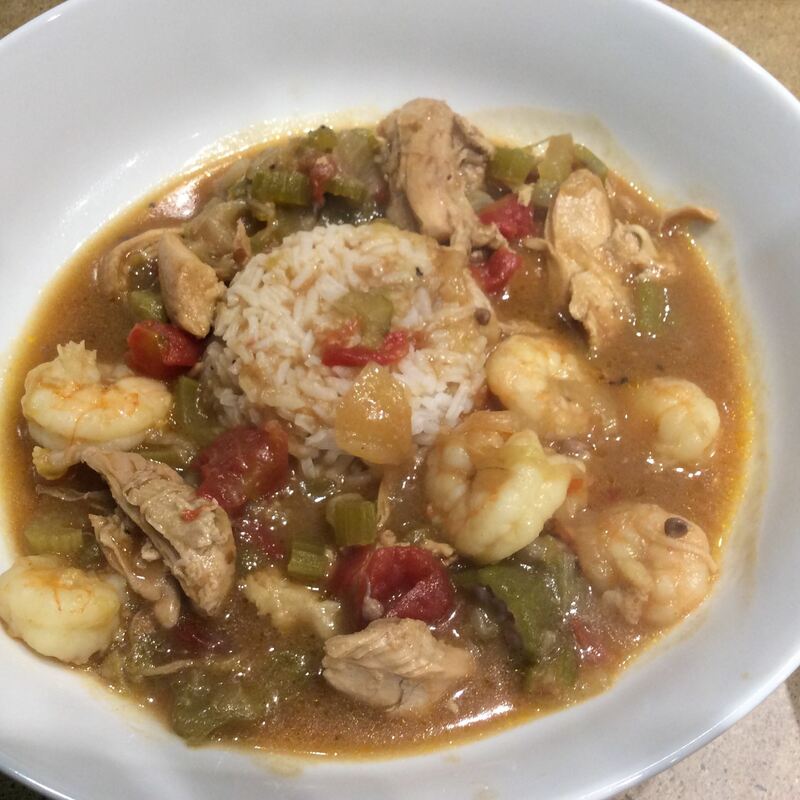 I have been making this gumbo since I found the recipe in a Cooking Light magazine back in 2002. I have tweaked it over the years. I have made it all seafood or all chicken but I like it best with both, you can also add crawfish. Traditionally gumbo starts with a roux—a mixture of flour and fat that’s cooked slowly until browned. In this gumbo, you brown the flour in the oven. This technique provides a deep, nutty flavor without the fat. I know this is not a traditional recipe but this is a really good, low fat gumbol. Freezes well and warms up great the next day. Lightly spoon flour into a dry measuring cup; level with a knife. Place flour in a 9-inch pie plate; bake at 350° for 45 minutes or until lightly browned, stirring frequently. Cool on a wire rack. Heat oil in a large Dutch oven over medium-high heat. Add onion; sauté for about 15-20 minutes until golden. Add celery and cook until tender. Stir in browned flour; cook 1 minute, stirring constantly. Gradually stir in stock and next 6 ingredients (stock through tomatoes); bring to a boil. Reduce heat; simmer 1 hour. Add the chicken thighs and simmer until tender. Remove from pot and shred with 2 forks. Add back to the pot. Stir in shrimp, crabmeat, and hot sauce. Bring to a boil; reduce heat, and simmer 15-20 minutes. Serve gumbo over rice and a side of cornbread.